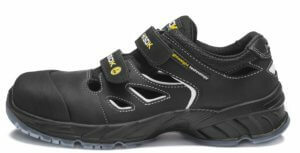 HKSDK’s safety sandals are well known for their comfort, flexibility and safety. Our safety sandals automatically adjusts to your feet giving you the absolute best possible support when walking around building sites or in your own home. A safety sandal from HKSDK comes in three models: Z2, R2 and H2. They all have their own unique features and advantages but all types will give you incomparably comfort, flexibility and safety. Our safety footwear is very comfortable during the summer months due to the design’s special focus on ventilation and safety combined in one sandal.